High efficiency, compact air/water chiller range. Compact chillers and reversible units. Inverter compressor. Chillers and reversible units. Extensive range, versatile applications. Chiller range with inverter compressor. High seasonal efficiency. High energy efficiency chillers and heat pumps for indoor installations. Compact chillers for large systems. 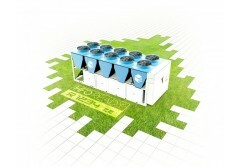 Revolutionary Air Cooled Modular Free cooling Screw Chiller range.